Water waste found poured down a stormwater drain during ‘Operation Scrap’. Photo: Supplied. Restaurants and cafes in Belconnen, Hawker, O’Connor, Manuka, Kingston, Civic, Braddon and Dickson have been put on notice after three businesses were found pouring waste down stormwater drains. Environment Protection Authority (EPA) reported they had received “troubling” reports of eateries tipping cooking oil, detergents, wastewater, chemicals as well as food waste down stormwater pumps. Inspectors from the EPA and the Health Protection Services (HPS) inspected 25 food businesses in a recent audit, which looked at cleaning practices, kitchen maintenance, cleaning facilities, and any pollution at the rear of restaurants – particularly around stormwater pumps. EPA spokesperson Narelle Sargent said officers discovered three businesses pouring their waste down stormwater pumps. 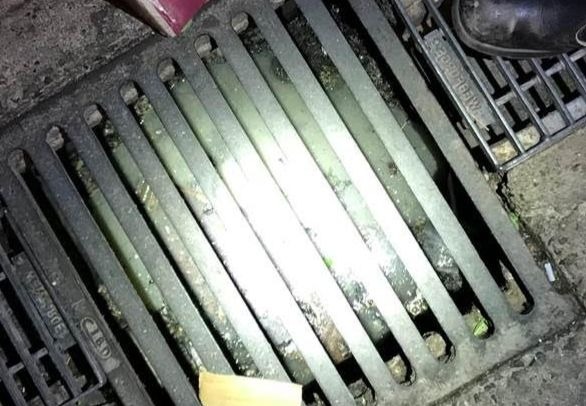 “Unfortunately officers found evidence of kitchen waste in the stormwater pumps at the rear of three businesses,” Mrs Sargent said. “These businesses were provided with information about keeping the environment around their premises clean and were verbally warned to stop putting waste down the stormwater system. On-the-spot-fines of up to $200 for individuals or $1,000 for businesses can apply for acts of stormwater pollution. HPS Executive Director Conrad Barr said that in addition to stormwater pollution, inspectors found minor maintenance issues at three businesses, including full cooking oil waste bins and an area of flooring which required resealing. “The items identified in the inspection reports will be followed up with the businesses concerned as part of normal business,” Mr Barr said. Mrs Sargent reminded local business that stormwater feeds directly into our creeks, lakes and rivers. “What people, and businesses, need to remember is that stormwater feeds directly into our creeks, lakes and rivers without treatment – therefore what you put in it, ends up in our water systems,” Mrs Sargent said. Food businesses wanting more information about food safety standards can call the HPS on 6205 1700 or visit here and the community can report any incidents of stormwater pollution to the EPA on 13 22 81.